Have donor provide urine sample and let stand until it's room temperature.� Open the foil pouch and remove the test device & eye dropper. Using the enclosed dropper, withdraw the urine sample and add 4 drops into the sample oval shaped well on the cassette. Results are available in within 10 minutes. Results obtained after more than 10 minutes may not be valid. Positive: One colored line appears in the control (C) region. Negative: One colored line appears in the control (C) region, and another colored line in the test (T) region. ��The color intensity of the test line may be weaker or stronger than that of the control line, but regardless of the intensity, the result is negative. Invalid: No line appears in the control zone �C�. If the test device does not produce a band in the control region, check the testing procedures, samples, and/or control materials and repeat the test using a new device. 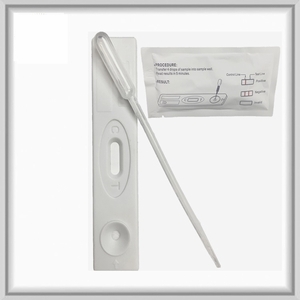 Compared to dip panel tests, cassettes have much less opportunity for procedure mistakes because dip panel/strip tests could be under or over dipped and provide an incorrect test result.� When you purchase our cassette, which includes a pipette (dropper), you�re able to deliver the exact amount of urine needed for accurate results.